1. Park Meeting ... There will be a community meeting to discuss all facets of the future 5-acre park at Project Renaissance on the 19 acre plot that used to be the Shallowford Hospital site. The meeting is tomorrow night, NOV 19, at the St Patrick's Episcopal Church starting at 7 PM. There will be a briefing at 7:15 PM prior to the open discussion. St Patrick's Church is located just across from the entrance to Brook Run Park on N. Peachtree Rd. This is everyone's opportunity to review a very basic design and put forth your inputs. Pls. make max effort to attend. 2. Meeting with DeKalb County (DC) CEO ... The DC CEO, Lee May, is coming to Dunwoody to meet with the citizens concerning the future of the DC CEO's position as well as other possible forms of government for DC. He usually covers a broad range of subjects that will be of interest to all of us. This is your chance to get the information first hand. The meeting is this Thursday, NOV 21, at Dunwoody High School (DHS) from 6:30 - 8:30 PM. It would be great to see the DHS auditorium packed with Dunwoody citizens. 3. Light Up Dunwoody ... This popular city wide event will happen this Sunday, NOV 24, at it usual location ... the Spruill Farm House ... at the corner of Mt Vernon Rd & Chamblee Dunwoody Rd ... from 3 - 6 PM. There will be events for all ages so bring the whole Family and be prepared to have an enjoyable time. The tree lighting ceremony itself will take place at 5:45PM. See you there. or check our website at http://www.dunwoodyga.gov"
6. Storm Sewers ... It is the season of the falling of the leaves. We have works hard to get all our storm sewer clean and in good working order .... notice that even with all the heavy rains of this year, we have not had any significant street flooding. To make sure our storm sewers continue in good working order please ensure that none of the leaves or other yard debris goes down storm sewer drains on our streets. Cleaning the storms sewer of yard debris uses our storm sewer dollars that can be put to better use replacing the older storm sewer pipes. Thanks. a. We have folks passing our school buses when the buses are loading and unloading our school children and speeding in school zones. Folks these are basic mandatory laws that involves the safety of our schools children. Also, drivers are not always yielding to pedestrian in the crosswalks. These actions are dangerous as hell. We should all expect and ensure that we are in 100% compliance with these critical safety issues. Our children and our pedestrians thank you. 8. That is all for tonight. I thank all of you for your support in the recent election. I ensure each of you, that regardless of how you voted, I will continue to represent everyone to the upmost of my ability. Meredy and I wish each of you and your Families a Happy and Blessed Thanksgiving. We all have much to be thankful for. Good night! Just a note of personal thanks to all the citizens of Dunwoody who exercised their right to vote on Nov. 5 in support of my re-election. I appreciate the confidence that you have placed in me. I take your support seriously. I look forward to serving you as your councilman in District 1. I will continue to do what I promised during my campaign by providing fiscally conservative, ethical, positive and common sense leadership to ALL the citizens of District 1 as well as ALL the citizens of our great city. It is time we come together in a positive frame of mind to keep moving forward to enhance the quality of life for all of our citizens. A special thanks to all those that worked on my campaign including my wife, Meredy, campaign manager George Stewart, campaign treasurer and advisor Maria Richmond, the meet and greet hosts, those that allowed me to put a campaign sign in your yard, those that made phone calls and wrote letters in my support, the financial donors, you that gave me words of encouragement and the 17 sign-wavers at the polling places on election day. All of you are the very best and so appreciated. Please click on the image below for a larger version. Let Us Continue to Build Our City Together. 1. Feasibility Study for a Dunwoody Independent School District (DISD) ... Tonight, Monday, OCT 28, at 7 PM, at the Dunwoody City Council Meeting, Rep Tom Taylor will give a brief on the current status of the movement to establish our DISD. This is an item of importance to all our citizens and I urge you to make an effort to attend and hear Rep Taylor. Taking over our schools will be hard work but it can be done with the collected effort of all of us. Personally, I strongly favor taking control of our school, keeping our schools in their current locations, enhancing the structures to meet current standards and safety requirements and, being sized to accommodate the student population without the use of trailers. I would like to hear your thoughts. 2. Safety .... As I have walked the District One over the last few weeks I have a noted a safety item of common theme. I would highly recommend you have your address highly visibly displayed on your mailbox, mailbox pole and or painted on your curb. We all know about these high tech items like GPS, etc. but high tech sometimes fail ...the manual system noted above doesn't fail. If you have an emergency at your residence on some dark and stormy night having your address prominently displayed as I note above could be the key factor in our emergency responders finding you residence in a timely manner. 3. Zoning ... To clarify zoning laws, once a piece of property is zoned a certain classification — single family residential, multi-family residential, commercial, etc. — that zoning classification stays with the property for the current and successive owners. Generally, the city does NOT have the legal right to change the zoning. The zoning can be changed by the property owner requesting a zoning change and that change being approved by, in our case, the City Council. Since we became a city the City Council has not changed any property zoning classification to high density multi-family. FYI, there is an Information Forum concerning the recently passed zoning code changes that will be held at the City Hall tomorrow, OCT 29 from 9 - 11 AM. 4. Veteran's Day Meals ... There is a list of restaurants offering Veterans reduced prices, specials and in some cases free meals for Veterans and in some cases their spouses. One such restaurant, that has recently been added to this list, is the Chick-fil-A located in the Jett Ferry Shopping Center. This restaurant, from 5 - 8 PM on NOV 11, will be offering a free meal for the Veteran and spouse. Other local restaurants that I know of offering specials to Veterans are... Carrabba's, Chili's, Olive Garden, Outback, McCormick & Schmicks, California Pizza among others. 5. Vote ... The corner-stone privilege of our freedom is the right to vote. A lot of our fellow Americans have given their life to ensure our right to vote is preserved. Of course my preference is that you vote for me, but above all I ask each of you to vote on NOV 5, 2013. The polls will be open from 7 AM to 7 PM. If you want to find your polling location go to this website ... http://mvp.sos.state.ga.us/ ... fill in the blanks and hit "submit." 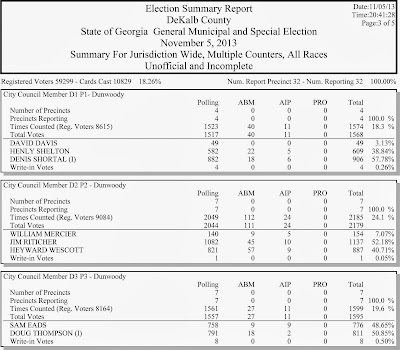 The main voter information website for us is ... http://web.co.dekalb.ga.us/Voter/VoterInformation.html. If you fax (fax # 404-298-4038) or email (absenteeballot@DeKalbcountyga.gov) your absentee ballot application in you will still have time to receive your ballot and mail it back in time to be counted by the voter deadline of NOV 5. To get your absentee ballot application go to this website .... http://sos.georgia.gov/elections/elections/voter_information/absentee_ballot_app.pdf. 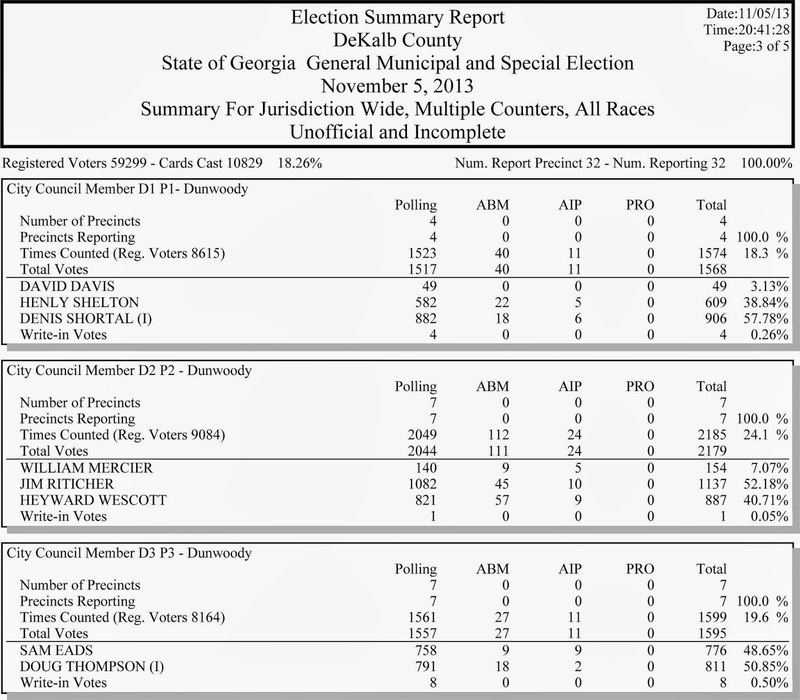 A copy of the sample ballot for all of Dunwoody maybe obtained at this website .... http://web.co.dekalb.ga.us/Voter/pdf/SBCityDunwoody.pdf. 1. Clean, Fix and Shine-Up Dunwoody / Serve Day .... This annual event is tomorrow, Saturday, 9/28/13. The main sponsor of this event are all the churches in Dunwoody, spear headed by the North Atlanta Church of Christ (NACOFC) and the Dunwoody Volunteer Coordinating Committee. The main city project event - there are plenty of events other than the city project - this year is the planting of 300 trees at various city properties located throughout Dunwoody. The main locations will be our parks. To sign up you can go to this website ... www.nacofc.org/#/serve-day ... and then show up at 7:30 AM at the NACOFC located at 5676 Roberts Dr or you can go to Brook Run park at 8:30 AM and gather by the children's playground. We still have room for plenty of workers. Come on out and show that great community spirit for which Dunwoody citizens are known. I will see you there. 2. Paving ... An additional 2013 paving contract for eight street was approved at last Monday's City Council Meeting. With contingency the contract is for $420,000. The plan is to start paving next week. The criteria was to pave streets that did not require extensive deep patching prior to paving and were located relatively close together to speed up the process as weather will be a factor later on. We anticipate the paving to be completed in three weeks with good weather. 3. Sidewalks ... The current main effort for this year sidewalk construction schedule is along Womack Rd. When that is finished the final sidewalk project for 2013 will be started. That project is Valley View Rd. Our anticipated completion is by the end of November with the cooperation of the weather. The contracts for the sidewalk projects on Mt Vernon Rd, Hensley Dr and Peachford Rd will be let later this fall with construction slated to begin in the spring of 2014. 4. Dunwoody Zoning Code Rewrite (DZCR) ... As you know the DZCR has been on going for over a year and a half. This three year project is now in the final approval process and will be completed over a year ahead of schedule. In addition to issue of you concern there are two issues that on which I request your feedback. I ask for your viewpoint based on this happening at the house next to yours. 1. Section 27.12.60 B 5 ... Should recreation vehicles ... defined as water craft, motor homes (RVs), trailers and car carriers ... be allowed to be parked on a residential lot in a Residential Zoned area on a permanent bases? 2. Section 27.10.30 B 2 ... Should Household businesses be allowed is a residence in a Residential Zoned Area with the business having non-resident employees, with come and go customer traffic with hours of 8:00 AM to 8:00 PM? 5. That is all for now. Thanks for all your support and words of encouragement. Please pass this on to your friends, neighbors, members of your HOA or anyone you think maybe interested. If you would like to be added to my update email list just let me know and I will make that happen. Look forward to seeing you around out city. As you may have read in the Dunwoody Crier, I have announced my candidacy for Dunwoody District One (Local) City Council. When our family moved to Georgia 22 years ago, we chose Dunwoody as the most desirable place to live. We still strongly feel that way today. 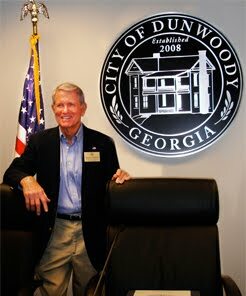 It would be my honor and pleasure to serve the citizens of District One and the entire city of Dunwoody. As a quick personal background - I was raised on a farm in the small town of Wright City, Missouri. After graduating from the University of Missouri with a BS in Agriculture Business / Economics, I entered the Marine Corps and served in Vietnam where I flew over 300 combat missions in the F-4 Phantom ... retired from the Marines Corps as a Brigadier General. In my second career, I flew aircraft from the DC-9 to the Boeing 747 for Northwest Airlines before retiring last year. My community service includes six years as the Co-Athletic Director of St Jude Catholic School and most recently as the Co-Chairman and Treasurer of “Dunwoody Yes” in the campaign for Dunwoody cityhood. Our oldest, Brian, a graduate of Notre Dame and Emory Medical School, served as a doctor in the Navy for 11 years and is now a cardiologist in Lincolnshire, IL. Matt, a graduate of the University of Illinois is currently a Major in the Marine Corps and a former Blue Angel F-18 pilot. Our youngest, Andy will graduate from Auburn University in finance next month. We are the proud grandparents of Will, Anna and Dan Shortal. The following are my ideas on some of the issues as we "Look to the Future of Dunwoody"
• Have an input voice into our local schools with the DeKalb County School Board. Although we will not have a vote, that does not mean we can't have a voice. • A "right sized" police force that provides adequate protection and peace of mind for our citizens without the perception of a "police state"
• Look at the entire spectrum of the needs of our city and "fix the worst first"
I look forward to discussing the issues with you and earning your support for my candidacy on election day November 5, 2013. 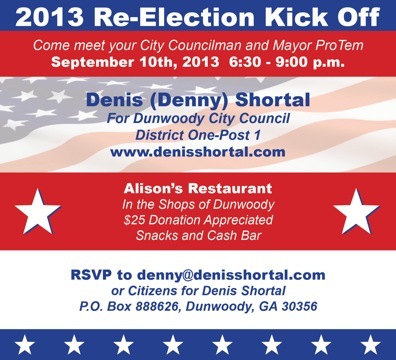 Our address is Citizens for Denis Shortal, PO Box 888626, Dunwoody, GA 30356. Let us "Look to the Future of Dunwoody" together. George Stewart is my Campaign Committee Chairman and Maria Richmond the Treasurer. Mt Vernon Rd will be closed starting approx. at 6 PM tonight, Friday, JUL 12th thru approx. 6 AM on Monday, JUL 15th from Vermack Rd to Chamblee Dunwoody Rd at Dunwoody Village. The reason for the closure is that we have to replace three storm sewer pipes that run under Mt Vernon Rd. We will have two crews working long hours on this project to get it completed by Monday morning by 6 AM. There will be limited business and resident access to those doing business or living within the closed section. The main detour route will be Vermack Rd to Womack Rd to Chamblee Dunwoody Rd. You will note on the below map the business and resident access (yellow), the detour thru route (green) and the construction zones (red). Please allow a little more time to get around the construction area and, some patience will be required from all of us. Link to Mt. Vernon Road Detour. Tonight (6/20) the Brook Run Food Truck Concert goes from 6 - 9 PM. My thanks to the DHA for taking the lead of this wonderful community spirit building event. Tomorrow Night (6/21) "Dunwoody at Dusk" at the Park Place Shopping Center takes place for 5:30 - 8:30 PM. Restaurants and retailer will be offering special promotions. My thanks to our Chamber of Commerce for leading this community building event. 1. Paving Job On Mt Vernon .... As I mentioned in my update in January the contractor and supplier of asphalt did a much less than satisfactory job paving the east bound lane on Mt Vernon last fall. Well tomorrow the contractor is coming back to mill and repave the areas of concern. The bulk of the problems are on the east bound lane from the Dunwoody Station entrance to just before the initial turn in to Dunwoody Baptist ... there are some other smaller spots. In addition, the entrances into Ridgeview Rd, Dunwoody Station and the right lane from Mt Vernon to Ashford Dunwoody Rd will be redone. We hope to complete this in one day but it could take longer. Tomorrow's weather of sunny and 80 degree make it a good paving day. While the paving is being done there will be some traffic delays so patience will be required ... suggest you avoid the area if possible. FYI, this is being done at no cost to the city. 2. Intersection Improvements ... The final design for the intersection of Mt Vernon and Vermack is in progress. The objective is to be ready for a public meeting in late May or early June ... check the city website for the actual date. As a general plan there will be left turn lanes installed going westbound and eastbound on Mt Vernon. If all goes well, right-of-way will have to be purchased which will take 6 months or so and construction will start in late spring / early summer 2014. 3. Storm Sewers ... We have three storm sewers that are failing between Dunwoody Village Parkway and Vernon Oaks Dr on Mt Vernon. All three will have to be replaced this summer after school is out. This will mean some road closures and detours. We will try to minimize the closures by starting on a Friday night with the attempt to do all of them at once … or at least two. We need a Saturday to ensure we can get materials from the suppliers in case we run into unexpected problems (they are not open on Sundays). 4. Two Outstanding Community Events. Both of these events are great for community spirit (all your neighbors will be there), run by volunteers and the profits go directly to enhance our park facilities in our City ... it just doesn't get better than that! 5. Lemonade Days ... On April 17-21, 2013 Dunwoody Preservation Trust (DPT) will host Lemonade Days, its annual fund raising event. Lemonade Days 2013 will again feature the same format that we have enjoyed for the past few years. This year we plan to continue our extended carnival hours, add rides, diversify more broadly the food choices and add new activities. This new schedule has been developed based on community feedback to allow families more flexibility in planning their participation. We expect to have outdoor activities including amusement park rides, games, food vending and other individual and family activities. Times are Wednesday and Thursday from 4 to 10:00 PM, Friday from 4 to 11 PM, Saturday from 10 AM to 11 PM and Sunday from 12 to 6:00 PM. Additionally there will be a face painting booth and a petting zoo on both Saturday and Sunday. Folks, this is fun for the whole Family of all ages. Also, there maybe a dunk tank with some of your favorite folks. 6. Dunwoody Nature Center "Monarchs and Margaritas" ... The Dunwoody Nature Center’s largest annual fundraiser, Monarchs and Margaritas, will be held at the South Terraces Atrium in Perimeter Center on Saturday, April 27, 2013 from 6:30-10:30 p.m. Festivities include live and silent auctions, music, delicious food and drinks (including margaritas, of course) and a special Birds of Prey show. Auction items include vacation destinations, such as Amelia Island, Palmetto Dunes on Hilton Head, Lake Wedowee, and the Blue Ridge Mountains; tickets to sporting events; wine tastings; beautiful art work; and a farm-to-table catered dinner for 12 at a secluded pocket of the Nature Center. Proceeds from the event will benefit the quality programming, environmental education, and outreach efforts of the Nature Center. To purchase tickets ($100 each), donate auction items, view the auction catalog or become a sponsor, visit the event website at www.monarchsandmargaritas.org. 7. Dunwoody Green Farmers Market ... This favorite moves back to the Dunwoody Village Area starting 17 APR 2013 and then ever Wednesday from 0800-1200. The new home is at the parking lot at the Shops Of Dunwoody located at 5500 Chamblee Dunwoody Rd. The exact location will be behind the Bank of North Georgia and across the street from the Sunshine Car Wash.
8. Scam Warning in Dunwoody ... From our outstanding police department .... Recently there have been burglaries/thefts in the Metro Atlanta area involving work crew scams. In these scams, the crew will say they are doing work in the neighborhood or at your neighbors house and it may affect your back yard. They try to get the homeowner out of the house and to the back yard. While walking to the back yard the worker will make a phone call and speak in code or a different language signaling the other members to enter the house and steal items while the homeowner is distracted. Some of these crews have posed as tree cutting companies. Remember any solicitor coming to your door must have a picture ID issued by the City of Dunwoody and they are required to show it to you. 9. Stage Door Players (SDP). For those of you that enjoy a great stage play I highly recommend the current production at our own SDP ... "I Love You, Your Perfect Now Change." Meredy and I saw it last Friday night.with a sold out audience and it was fabulous. A lot of the folks that I see at SDP are around my age .... I highly encourage some of our "younger generation" citizens take advantage of this great community asset. You can call 770-396-1726 for tickets. 10. That is all for now. Please pass this on to all your friends, neighbors, members of your HOA or anyone else you think maybe interested. If anyone would like to be added to my email list please let me know and I will make that happen. Thanks for your continued support and input. Spring is in the air … good times are here again. See you at the City Council meeting tonight. Elaine Boyer Meeting in Dunwoody ... Elaine Boyer will be holding a "town hall" tonight, 12 FEB, at the Dunwoody Library at 6:30 PM. As you know Elaine is our Commissioner on the DeKalb County (DC) Board f Commissioners. It will be interesting to hear Elaine's perception on the state of DC. Come to listen and ask questions. We should all remember that we are an integral part of DC. Pls pass this info to your friends, neighbors and HOAs.